These are not your typical bridesmaids. Thor, 5/6. I just saw a screening of this film this past Saturday, and I will say that it is definitely worth seeing. The 3D was great as well. Something Borrowed, 5/6. Based on the book of the same name, by Emily Giffin. Priest, 5/13. Vampires! Paul Bettany! Looks creepy. Hesher, 5/13. Joseph Gordon-Levitt with super-long hair. Bridesmaids, 5/13. I have already seen this at a screening and ladies (and men), you will want to see this movie. 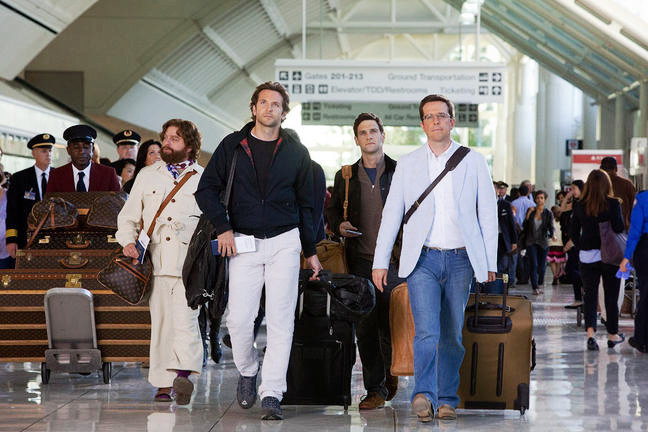 Kind of like The Hangover but with women main characters. Everything Must Go, 5/13. Will Ferrell holds a yard sale to get rid of all of his worldly possessions, after being kicked out of the house by his wife. Pirates of the Caribbean: On Stranger Tides, 5/20. Johnny Depp as a pirate, in the 4th installment of the series. Need I say more? Kung Fu Panda 2, 5/26. I admittedly have only seen parts of the first one, but the trailer makes this look like it could be a cute movie. The Hangover Part II, 5/26. Will it be as epic as the first one? The original cast, for the most part, returns, so there is a strong possibility that it will be just as crazy and out of control as its predecessor. The Tree of Life, 5/27. Brad Pitt plays Sean Penn's father ... in flashback scenes, of course. X-Men: First Class, 6/3. Prequel to the X-Men series of movies. James McAvoy! The Green Lantern, 6/17. Another comic book movie adaptation, starring Ryan Reynolds as the title character. Cars 2, 6/24. I still have to see the first one ... but the trailer looks pretty good. Bad Teacher, 6/24. Check out the red band trailer for this film, looks like it's going to be raunchy and hilarious. Stars Cameron Diaz as the bad teacher in question, Jason Segel, and Justin Timberlake. Transformers: Dark of the Moon, 7/1. They were filming in Chicago all last summer, and Shia LaBeouf is back, in the third installment of the series. Larry Crowne, 7/1. Tom Hanks in the title role (and directing!) and Julia Roberts. Horrible Bosses, 7/8. Disgruntled employees decide to try and kill their bosses. Harry Potter and the Deathly Hallows, Part 2, 7/15. This is going to be a bittersweet end to one of my favorite movie series, but the movie itself looks like it's going to be epic. Captain America: The First Avenger, 7/22. Chris Evans is Captain America ... another comic book movie. Friends with Benefits, 7/22. I think I saw this movie already a few months ago ... it was called No Strings Attached. Can Mila and Justin do it better? Crazy Stupid Love, 7/29. Emma Stone, Ryan Gosling, and Steve Carell all in one movie together? Yes, please. The trailer for this looks hilarious as well. Cowboys and Aliens, 7/29. One of the weirdest plots I've heard of, but it just may work. Planet of the Apes, 8/5. Apes and, um, planets. 30 Minutes or Less, 8/12. Jesse Eisenberg is a pizza delivery boy who is hijacked by some bad guys. Was filmed in Grand Rapids last summer, too. The Help, 8/12. Am looking forward to this one, as the book was fabulous - the movie has a lot to live up to. Harry Potter! I am so sad that it is going to end. Me too, but the trailer for Deathly Hallows Part 2 is out, and it looks fantastic :).